Subscribe in iTunes, Stitcher, direct download. Walter Brueggemann is a husband, pastor, writer, author of 58 books and hundreds of articles. He is widely considered one the most most influential Old Testament scholars of the last several decades. He taught for over 4 decades. 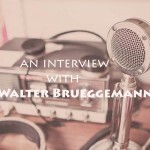 Brueggemann participated in Bill Moyers’ 1990’s PBS television series on Genesis. We talk about his story, and his book Sabbath as Resistance: Saying No to the Culture of Now.